We are raising broad-breasted birds again this year on pasture and organic feed. They will, however, not be quite as old when we butcher them, so the average weight will be a little lower. We expect them to range from #18 to #24. Last year the average was #30. As seen below, birds that size can cause issues such as back strain trying to get them into the oven.. So how do you get in line for one? Well, some of the savvy folks who got chickens from us handed us a deposit of $60 for a turkey when they picked up their chickens. That means that we have only 6 remaining turkeys, so you might want to get on the bandwagon quickly. Last year we literally had dozens of phone calls the week or two before Turkey Day, of desperate folks looking for local, organic, pastured birds. This year, the pastured turkeys will be $5.50 per lb. The butcher weekend is coming up soon, October 25th to be exact. Yes, you will need to plan freezer space for these beasts. Last year when we butchered in November the weather was so cold the feathers were freezing to the work surfaces, so this year we opted for a weekend that should be above 40 degrees. This entry was posted in Farmer Adam and tagged Organic, Pastured Poultry, Thanksgiving Turkeys on September 10, 2014 by adalynfarm. 23 outside temp. The chill tank I filled the night before had a 1″ skin of ice on it. That’s what we did this weekend. We transitioned 13 turkeys 8 chickens and two geese. Process and Transition sound so much better than Butcher. However, given my sense of humor, I really like the term “ice camp”. It sounds more fun (it was very appropriate given the weather), and folks still know what you mean. Usually. The chickens and geese were for us, and the 13 turkeys yielded #375.4 of hanging weight bird (looks like what you buy in the store). The final price per pound was $4.05lb. There were two ‘weight groups’ the #21-#23 range (all the hens) and the #31-#35 range (all the toms). Bingo. Turkey’s on the move. There’s 65+lb of Thanksgiving goodness there. The biggest was #34.9 and the smallest was #21.4 which was much more in the range of what we were looking for. We typically host between 15 and 23 folks for Thanksgiving, and we like leftovers. The Royal Palm heritage birds we typically raise are #8 to #16, and go through a little more feed (per lb) and a longer grow out (more of our time moving fencing, water, fretting over predator loss) and while they are enough for our meal, there are scant leftovers. So the birds this year were Broad Brested Bronze. There is just no way to get the size without using the hybridized meat birds. And before folks start freaking out, these are not some kind of GMO monster. They are bred the same way your pet poodle was bred, selecting over time for traits that the breeders want. Our birds were brooded in our spacious brooder box until they had enough feathers to handle nights without the heat lamp. Then they did a few rounds in the pasture pens, kept safe at night, and moved every day onto fresh grass. Once they had gotten a little bigger, (no longer a grab bag meal for passing birds of prey) they got moved out into the portable fencing. Moved every few days onto fresh grass. We fed them Organic feed, and they grazed like crazy (in fact several had crops full of grass when it was time to butcher them). We processed them on farm, so the furthest they will have traveled, will have been from our farm to your table (well I suppose they came from Idaho as day old chicks, but they were packed in a box smaller than what would fit my work boots, and sent US mail, so I’m thinking the carbon impact there would be minimal). One of the field pens they stayed in till they were big enough to not be snack size for air predators. We wanted to express our thanks, to all our customers, for letting us raise your Thanksgiving turkeys for you. It brings us a lot of joy and satisfaction to know that there are a dozen families out there who will be enjoying what we have cared for, nurtured and loved. The final review will have to wait till Thursday, when we will get a chance to see how they stack up compared to the heritage birds we have had in the past. The “crew”. Family and an awesome neighbor. We started at about 8 and were done by noon. If you are interested in getting on the list for next year, click on the link on the right, where it says “interested in the meat and potatoes? Click here to sign up for our news letter”. Deposits and progress payments totaling $85 held folks place in line, with the balance due at pick up. We will be sending out a newsletter in the spring when we are ready to dive into another season of gobblers, it will have the prices for 2014, important dates and other information… We will also be offering chickens again in 2014, and will most likely have pigs as well. 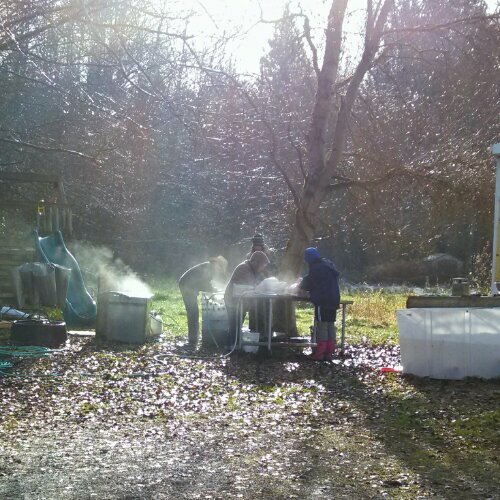 This entry was posted in Critters, Farmer Adam and tagged local produce, Organic, Pastured Poultry, Stanwood, Thanksgiving Turkeys on November 27, 2013 by adalynfarm. Another week, another pasture move. 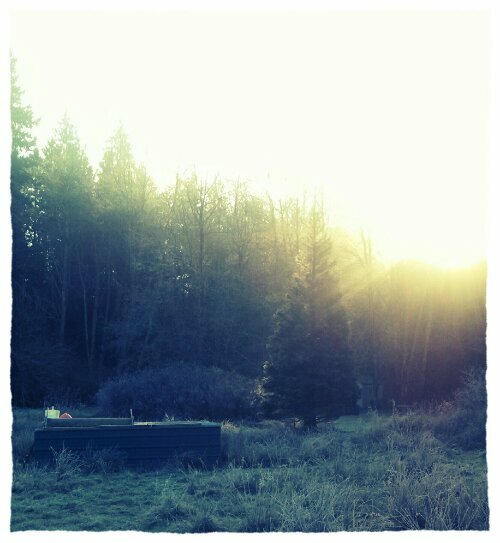 The turkeys don’t graze quite like the geese, or goats. And they don’t poop like 100 meat chickens. So they get to move to fresh grass once a week. Although as they get closer to T-day, it might get a little more frequent. As will my apprehension. And it’s not apprehension about the actual butchering, it’s the fact that a dozen turkeys will leave our farm just a few days before Thanksgiving, headed for what is probably one of the most recognized (and popular) family meals of the year. What keeps me up is the knowledge that we don’t have much wiggle room. If a dog or other predator was to get in now, odds are someone might not get a bird, but with over $75 of feed alone, invested in each bird there is an economic component as well. And all this doesn’t even get into the animal husbandry, and love of the animals that an end not by my hand (via a predator) would imply. I’d say we raise our animals with some of the same prejudice we are raising our children with. They don’t get antibiotics (unless they show a profound need for them), they get good fresh, local food, the shelter they need, but not pampering (our kids have chores the don’t like, I was told it builds character), vitamins and the occasional treat. We also try to raise them with lots of love. We don’t let them play with sharp sticks, or run around outside after dark (unless they are supervised, or in an enclosure). Having a hard time telling if I’m talking about our kids or our animals? I am too. Our kids even get out on grass just like the birds, but the turkeys eat more grass…. Although when I look at these critters, I can’t help but feel in a sound sleep, our girls think circles around the turkeys. 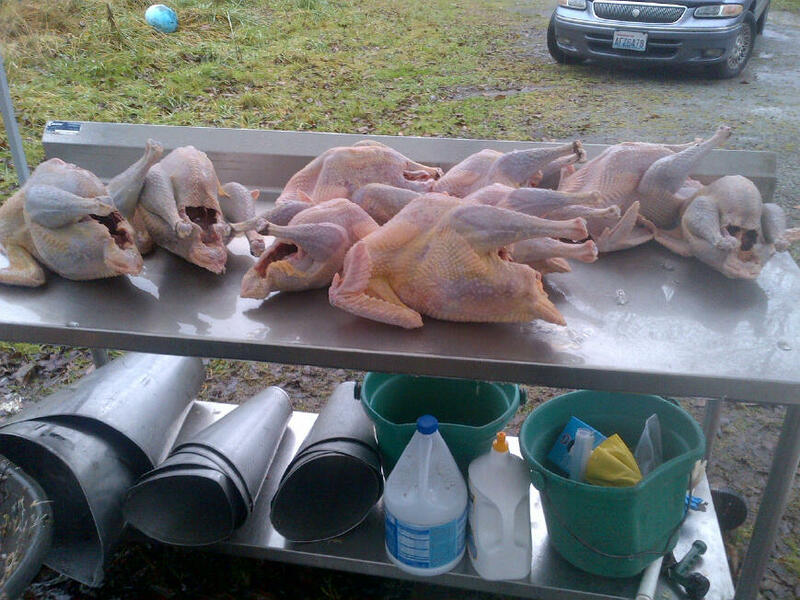 This entry was posted in Critters, Farmer Adam and tagged Organic, Pastured Poultry, Stanwood, Thanksgiving Turkeys, Turkeys on October 24, 2013 by adalynfarm. The turkeys are on pasture! Two trips and we were done! Way faster than the 90 meat birds. They are doing well, and have made it through the first nervous night or two with no problems. We’ll see how they handle the rain though, as they like to bed down where they have no overhead protection. They did however figure out where the hanging water was, and that is a relief. 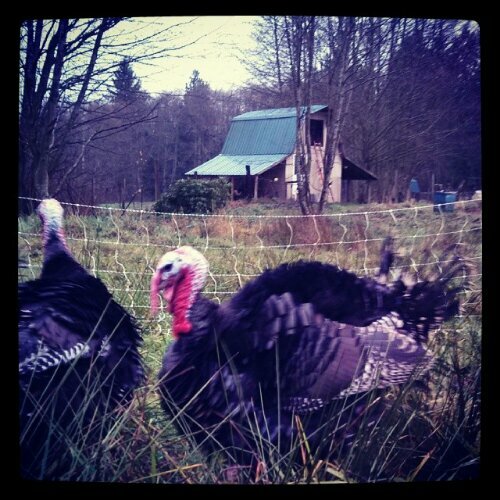 This entry was posted in Critters, Farmer Adam, Food and tagged Organic, Pastured Poultry, Stanwood, Sustainable farming, Thanksgiving Turkeys, turkey on July 26, 2013 by adalynfarm. Well I suppose Thanksgiving is in our rear view mirror now. In fact, if it weren’t for the frozen bits still waiting to be rendered into broth, it might not be on my mind at all. Except for the turkeys out in the field still. They were the ‘experimental’ birds. We have been looking for a low input, no-fuss no-muss solution to paying $12 per poult to buy day old chicks and then raise them. We had let some of our hens sit eggs, to see how it would work out. We hedged our bets, and bought poults as well. Cause we didn’t want to come up empty on T day. There are 5 of them, and they will head off to Ice Camp on February 2nd. This year was our test run year for selling birds. We are in the ‘lucky’ position to be able to fund a small scale grow out experiment, with a low per pound price, for mostly family, and then watched our feed costs and labor inputs. All in all, excluding the cost of the poults (remember the $12 each) we are out about $4.20 per pound, not including the processing costs, poult cost. So you could say ‘feed costs’ were about $4.20 per lb of finished bird. That may sound like a big hit, but when you think about the fact that they were fed 100% organic feed, and pastured it’s a little more understandable. Add to that the fact that they were all heritage breeds. That means that the hens topped out at about 8# and the biggest tom was #16. #16 you say, that’s hardly enough for a family of 5, let alone guests. I assure you that our family, and extended family, who joined us, all ate all they could, and took turkey home with them, and we had a pound or so of left overs in our fridge for a couple of days. In total that was 9 adults and two kids. Yes, food that’s grown naturally does fill you up faster. *Edit* we will be doing full organic, pasture raised, broad breasted birds this year (2013). We had more folks asking for larger birds than we get out of the heritage birds, so for now, the heritage birds will wait in the ‘wings’ for a possible future appearance. 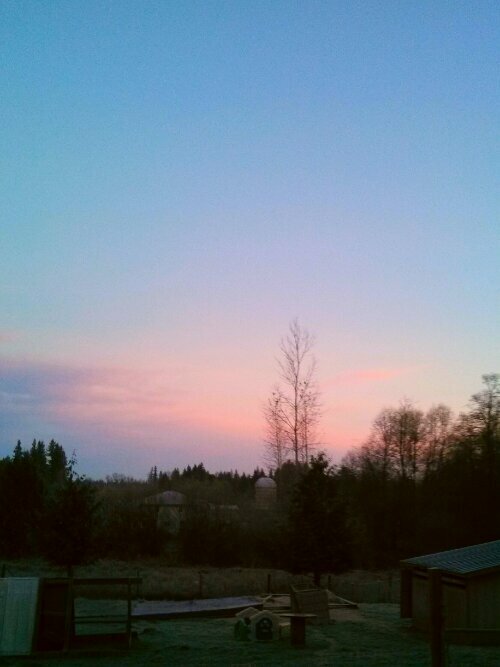 This entry was posted in Critters, Farmer Adam, Food, Mobile Blogging and tagged local produce, Organic, Pastured Poultry, Small Farming, Stanwood, Thanksgiving Turkeys, Turkeys on January 11, 2013 by adalynfarm.